Electric hoists on overhead travelling gantries have been successfully installed at several sites. Typically these are suspended from the existing steelwork, either attached to the portal frames of the factory or on a purpose made steel framework suspended from the factory roof. The gantry can have one or two electric hoists that lift the trusses from the jig/bed to the peak-up position and then move them to waiting stacking trolleys or to a stack. Note: A structural engineers report should be obtained before installation. A typical cost for a hoist system is between £8000and £17000 but in most cases employers have seen efficiency gains and significant staff approval. One occupier reported less sickness absence, particularly on days where heavy trusses were scheduled to be lifted! 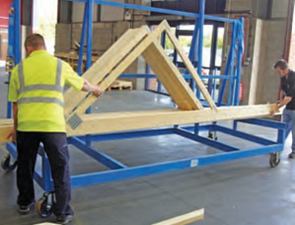 Truss trolleys can be used to lift completed trusses off the bed. 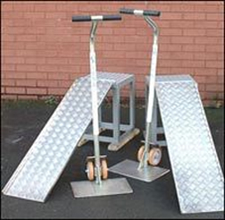 They are used in pairs and are like a modified sack trolley with a short lifting plate, two wheels and a long handle. The plate is positioned under the truss and downward force is applied to the handle. This lifts the truss allowing it to be slid off the edge of the bed, down temporarily installed ramps, onto the stacking trolley. The truss then has to be manually pushed to the peak-up position. However this is made easier as the truss is already at a better height for lifting. Truss trolleys are more suited for small to medium sized trusses, for example up to max 95 kg. However, heavy trusses over this weight are best handled using a hoist.